StormX, a Blockchain-powered adtech and gamified micro-task innovators, today announced two strategic partnerships with Kyber Network, a decentralized and trustless network that facilitates instant switching of crypto-assets on Blockchain platforms; and publicly-listed Global Blockchain Technologies Corp (TSXV:BLOC), an investment company providing investors access to a basket of holdings within the Blockchain space. The Kyber Network will be integrated with the StormX platform to enable anyone to seamlessly purchase STORM Tokens for use in the Storm Market ecosystem with any token supported by Kyber Network. The availability of this functionality will depend on the development roadmap for Kyber Network but is expected to be available by Q2 2018. The Kyber Network allows for the instant readiness of digital assets by providing payment APIs and a contract wallet that lets anyone receive rewards from any token. This promotes a seamless user experience for cryptocurrency assets and creates cohesive and cost-effective participation within the platforms integrated with the Kyber Network. “Partnering with StormX is an exciting development for Kyber Network, as it gives us exposure to StormX’s impressive monthly active user base of 270,000 individuals. This will generate more traffic to our network and drive growth on our end. In turn, our users will have the opportunity to participate in a gamified platform that is disrupting the micro-task industry. Furthermore, we hope the partnership will go beyond benefiting the parties involved to promote the perception of tokens as a tradeable asset class to the global Blockchain community,” said Kyber Network CEO and Co-Founder Loi Luu. Through the partnership with Global Blockchain, StormX will receive the resources necessary to reach its full potential as a gamified micro-task platform. These resources include access to a team of prominent industry experts, technical development, and legal support. Global Blockchain is a Canada-based publicly traded investment company that seeks to simplify the process that connects interested investors to leading Blockchain projects and cryptocurrencies. Steven Nerayoff, Esq. LL.M., a member of the StormX Board of Advisors and Founder of Alchemist Ventures, is also the Chairman of Global Blockchain (TSXV:BLOC). “Global Blockchain’s mission is to go beyond just providing an opportunity to invest; we strive to leverage the growth of the Blockchain industry to maximize potential for investors while giving the best new Blockchain projects the resources they need to succeed. We believe working with StormX and its outstanding team of Blockchain pioneers will get us one step closer to achieving this mission and solidifying our standing as an innovation incubator,” said Shidan Gouran, President of Global Blockchain. StormX is the creator of the Storm Market ecosystem which includes Storm Play, Storm Shop, and Storm Gigs which will utilize smart contracts on the Ethereum Blockchain to manage gamified micro-tasks between buyers and sellers. 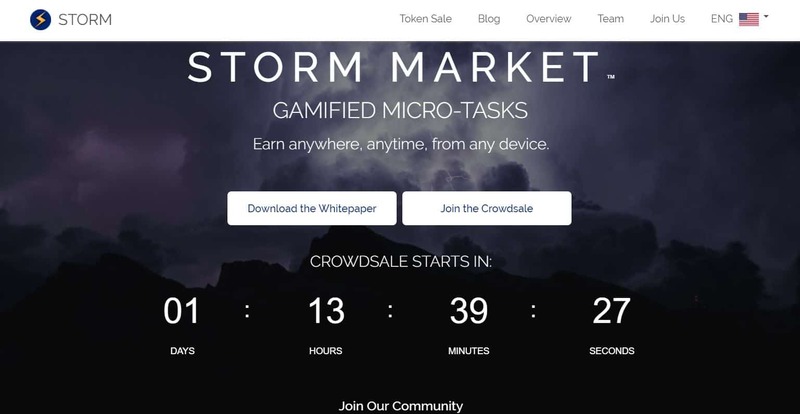 Users receive rewards in the form of STORM tokens which they can use to participate in the Storm marketplace.